On the immediate horizon is my only outdoor art show this year, Krasl Art Fair on the Bluff, in St. Joseph, MI. I want to present for this show very best of what I have to offer and therefore am working diligently to the purpose. Faced with the challenge of producing at least five new works in the next six weeks has left me charged with enthusiasm and I find myself working late into the evening in fervor. and anticipation of what I might accomplish. The piece shown in the image here is titled “Fourm Factor” specifically to interplay with the words four, form and factor as the image itself does. Form being the factor, while four serves as the backdrop. The shape embellishes on the four enhancing it’s value as an abstract form. It all works together nicely as a package. The reality of four dissolves, and the form becomes the only thing of value. The subtleties of volume and shape come to the forefront in a residual way. 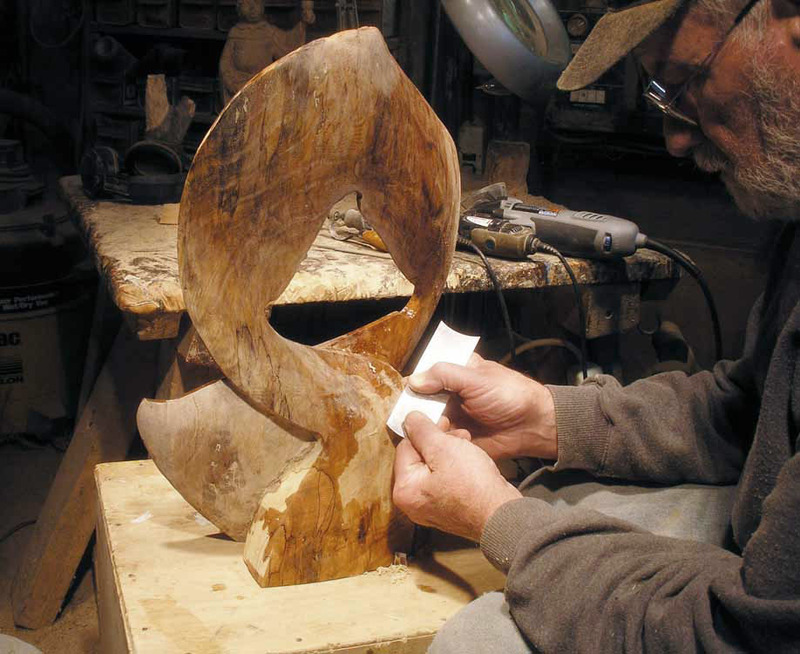 This piece is being carved from spaulted elm and the spault has created some magnificent nuanced changes in coloring to leave a complex underlying variance of tonal splendor. In order to make this richness of tone show in the piece, I must first painstakingly level all surfaces, removing bumps and shallows left over from the use of the more aggressive tools used in the development stages. To do this I use a tool, shown here, known as a cabinet scraper. Just a flat metal blade with a very sharp edge. It works similar to a wood plane in removing wood in minute curly shavings. Using this in a crisscross manner, pulling it over the wood, produces the desired result. A smooth level surface. Wood never disappoints, it just keeps giving and giving.